Pottery figures of infantrymen from the Han Dynasty are on display, along with hundreds of artifacts, in the "Terracotta Warriors of the First Emperor" exhibit at the Franklin Institute. A word to the wise: Do not try to pocket a piece of a cool ancient sculpture from a museum. A Delaware man accused of doing just that a couple of months back now finds himself in trouble with the federal government. Michael Rohana allegedly broke off the left thumb of a 2,000-year-old sculpture in the Franklin Institute and taking it from the popular Philadelphia museum after attending an ugly sweater Christmas party there on Dec. 21. Rohana allegedly took the piece from the Cavalryman in the Terracotta Warriors Exhibit, which is being shown at the museum until March 4. 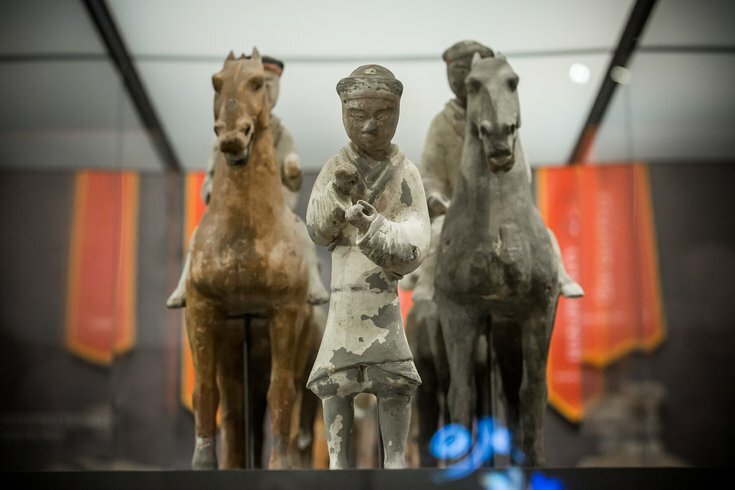 The exhibit, on loan from China, includes 10 terracotta sculptures – worth some $4.5 million – from the tomb of China's first emperor that date from 210 to 209 B.C. The allegedly stolen thumb is valued at more than $5,000 on its own, according to an affidavit filed in federal court in Philadelphia on Friday. The alleged theft was first reported by the Courier-Post. The affidavit states that Rohana entered the exhibit when it had been closed and roped off for the party. After checking out the exhibit with a cellphone flashlight, he put his arm around one of the Terracotta Warriors and took a selfie with it, according to the affidavit, written and signed by FBI Special Agent Jacob Archer. Surveillance video then shows Rohana appearing to break something off from the Cavalryman's left hand and placing it in his left front pocket before leaving the exhibit, the affidavit states. A museum staff member first saw that the thumb was missing on Jan. 8, which soon sparked the FBI investigation. Archer visited Rohana at his home in Bear, Delaware on Jan. 13 and asked him "if he had anything in his possession that he wanted to turn over to the FBI," the affidavit states. Rohana then took Archer to his bedroom and gave him the thumb, which has been returned to the museum, the affidavit states. The agent, who works with the FBI's Art Crime Team and formerly investigated drug and gang crimes in South Jersey, states in the affidavit that there is probable cause to charge Rohana with theft of major artwork from a museum, concealment and interstate transportation of stolen property.